Starts with good offense and gets better from there, buyt lays down Blight as it grows. The smaller the game, the more restraint is needed to prevent tipping the island over into being completely Blighted. The Wildfire can heal the land where it is, but may benefit from other Blight removal Powers so it can add Presence to problem lands without triggering Blight cascade. Removing Blight from its own lands limits its "Firestorm" innate power, however. For each showing on your tracks, do 1 Damage. If 2 or more are showing on your tracks, add 1 . Push all and any number of . If you add multiple into a land at the same time, only do the above effects once. 1 1 Damage per 2 you have. 3 Instead, 1 damage per 1 you have. 4 2 You may split this Power's damage among any number of lands with where you have . 7 In a land with where you have , Push all . Destroy all Invaders and . 1 . 4 2 Instead, remove 1 . 5 2 2 Remove another . Push 1 / per Terror Level from target land to adjacent lands without your . If there are no such adjacent lands, +2 . 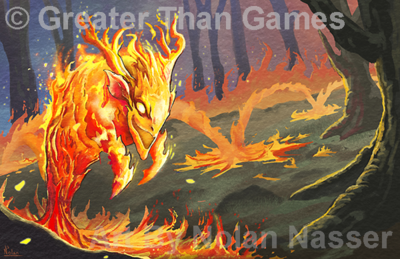 Growth: That third Growth choice grants more Energy the more Fire is uncovered on Wildfire's Presence track, granting ever-greater rewards as the game goes on. Its Energy track is relatively modest, but it'll be able to boost that substantially with Growth. Special Rules - Blazing Presence: Every time Wildfire adds Presence, it damages Invaders - and the land. Once it uncovers 2 Fire, it'll be Blighting the land with every Presence it puts onto the board. (Fortunately, Destructive Nature keeps that Blight from destroying the Presence.) In smaller games, it'll have to be very careful about adding Presence too quickly, lest it blow through the Blight pool! Innate Power - Firestorm: It doesn't just do damage when it adds Presence - with a small primer of Plant, Heart of the Wildfire can do Fire-based damage at one of its Presence. (Or, with more Fire and some Air, in multiple lands where it has Presence.) But those lands have to be Blighted - its fires must still be burning. Innate Power - The Burned Land Regrows: Fortunately, it has a way to remove Blight. It's not easy, though - Heart of the Wildfire's regrowth aspect is definitely secondary to its destructive aspect - and when it heals a land, it stops being able to use Firestorm there! What about its Unique Powers? Unsurprisingly, all of them have Fire. Most have Plant, and a couple have Air. Triggering its Innate Powers shouldn't be too hard, once it can play enough cards. Two of them are pretty expensive, but the other two are cheap. Heart of the Wildfire can probably make do with low Energy income, but will benefit from more. Flash-fires: fear and 1 damage, possibly Fast. This looks good for picking off Explorers. Threatening Flames: Frightens the Invaders, driving them away from its flames - or terrifying them even more if they're trapped! This Power is very powerful for the cost, but requires the same very specific setup as the Firestorm innate: a Blighted land where Heart of the Wildfire has Presence. Flame's Fury: Boosts the damage of every damaging Power a Spirit uses - card or innate. This seems best as a boon for fast-and-furious lots-of-Powers spirits over slower, big-hammer allies. Overall: Heart of the Wildfire is a high-complexity spirit. It has excellent offensive power, but its fires bring Blight to the land - and require some of that Blight to stay out in order for several of its offensive powers to work. In smaller games, it will have to be careful to avoid tainting the land (or outright losing), as the Blight it brings can be a substantial fraction of the available pool. In larger games, it'll have more leeway on Blight, but will face the problem of dilution: either the lands it sets up as deathtraps will be much sparser, or it'll concentrated be over in one corner and won't be able to help much in other portions of the board. This page was last edited on 1 November 2018, at 11:19.